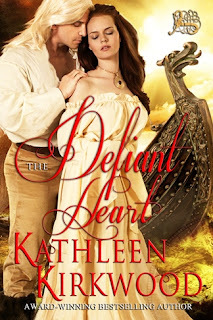 November BookBub Promotion: The Defiant Heart – FREE! November is upon us – the month for Thanksgiving in the United States. Mr. KK and I wish to thank everyone who has helped make my books a big success. In appreciation, we’re offering the second ebook of the HEART series, The Defiant Heart, for free from November 6th through November 10th, available only on Amazon. 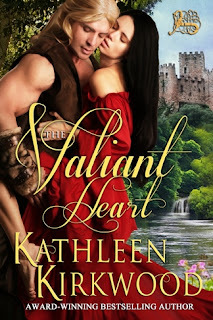 Also, to ensure that you don’t miss the first book of the series, The Valiant Heart will be specially priced at 99 cents for the same period. The mighty fleet of drakken swept north, carving the fog-bound sea. Swift and silent they coursed, triumphant high-prowed dragon ships, their hulls heavy with plunder—serpents in the mists . . .
A horn brayed long and deep, sending chills to crawl over Ailinn as the lead vessel signaled its companions through the curtain of gray. The others quickly took up the call and repeated the blast from stern to stern till the waters vibrated with the sound of trumpeting beasts. Thus begins the perilous adventure of a beautiful Irish captive and shining warrior of the North who vows to save her. Join Ailinn and Lyting as their story sweeps from the shores of Ireland to the lands of the Rus and the glittering courts of Byzantium. Amid dangers and intrigue, their passions set fire and will not be denied.